Daniel Wilson believes it is an insult on President Buhari for Imo state governor, Rochas Okorocha, to erect a statue of Jacob Zuma when he has not erected that of his own president. According to him, it shows how little president Buhari meant to Governor Okorocha. CAN ANY OF YOU IMAGINE A GOVERNOR OF ONE OF THE UNITED STATES OF AMERICA ERECTING A STATUE OF THE RUSSIAN PRESIDENT IN HIS STATE WITHOUT ERECTING ANY FOR THE PRESIDENT OF THE USA? WELL! THAT WILL BE CONSIDERED TREASON IN ALL RAMIFICATIONS YET ROCHAS IS NOT ONLY ROAMING FREE BUT STILL A GOVERNOR? CHAI I DON DIE! THIS IF YOU ASK ME IS TOO MUCH INSULT EVEN FOR PRESIDENT BUHARI, I MEAN, HOW CAN PRESIDENT BUHARI CONDONE SUCH INSULT FROM THE GOVERNOR OF A STATE THAT GAVE HIM 5%? IS IT BY JUJU? I ALWAYS KNEW THIS ROCHAS OKOROCHA WILL SHOW OUR PRESIDENT BUHARI HOW LITTLE HE MEANS TO HIM SINCE HE STARTED PUTING OUT BILLBOARDS OF HIS HANDSHAKE WITH OBAMA. 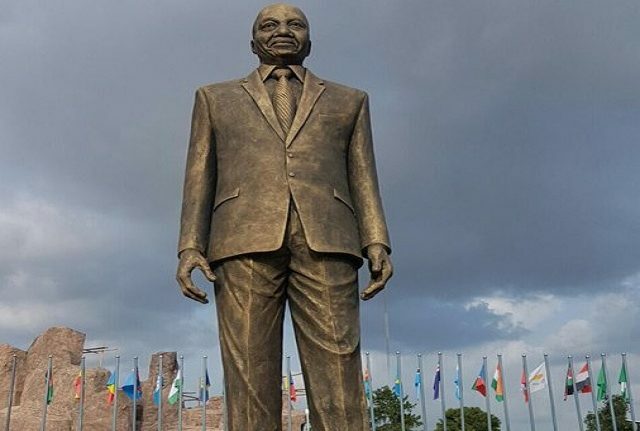 AS IF THAT IS NOT ENOUGH, NOW HE ERECTED A STATUE, NAMED A STREET AND GAVE THE HIGHEST CHIEFTAINCY IN HIS LAND TO COMMON JACOB ZUMA FOR WHERE BUHARI DEY.. MY GOD WHAT A SLAP IN THE FACE OF OUR PRESIDENT!! !